We’ve added a new tileset to the game, which is exclusive to the new “arcade mode”. 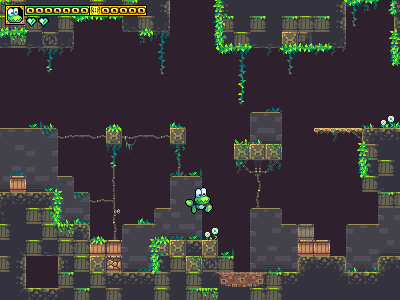 Unlike our full, story-mode tilesets, which are essentially a hybrid mix of 16×16<->64×64 tiles, intermixed in lots of wacky combinations, this tileset is a strict collection of 16×16 tiles. It’s not possible to do very organic rock faces and such in this tileset; everything will feel very blocky – however, it makes for much more flexible arrangements of tiles (since quite a few up-close arrangements were not possible with our story-mode tiles). Especially for our arcade mode, which will be based on some very tight platforming challenges, this is a good fit for gameplay. Also, here are some updates on forest stuff; showing off some new branches, better foliage, and one of the new palette shifts. We’ve loosely decided to save the forest stuff for the update immediately after the current one, since trying to do both arcade mode and forest at the same time is just too much to juggle – it means you’ll get an update in your hands sooner.